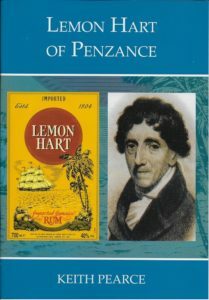 A new publication on the life of Lemon Hart, one of Cornish Jewry’s most famous ancestors who lived in Cornwall in the late 18th and early 19th centuries, has now been published by the Penlee Gallery and Museum Penzance. 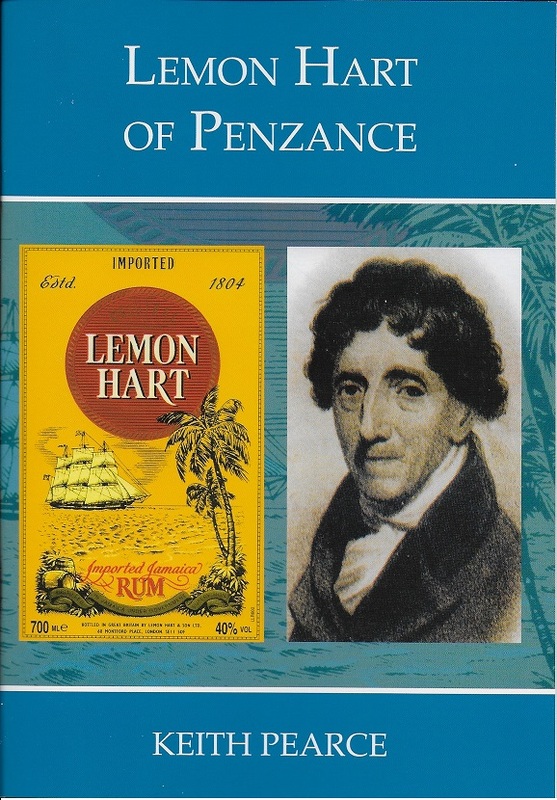 Written by local amateur historian, Keith Pearce, an expert on the history of Cornish Jewry, the biographical booklet contains much new information not previously published before on Lemon Hart and his family. Hart, most famous for his rum which still bears his name, has been the subject of much colourful mythology related to slave ownership, slave ships and plantations, and that he supplied the British \Naval ships with their ‘tot’ ofrum. This publication attempts to separate fact from fiction so that a more accurate picture of Hart can be established. The booklet is available through Penlee House, local, national and online booksellers for £5.00. Rosh Hashannah and Yom Kippur will be celebrated this year as follows. Erev Rosh Hashanah (Sunday, 9 September), 29 Elul 6:30 p.m.
Service will start promptly at 6:30 p.m. and will be followed by a catered evening meal provided by Kehillat Kernow to bring in the New Year 5779. Rosh Hashanah (Monday, 10 September, 1st day), 1 Tishri, 5776 at 10:30 a.m.
Service will be followed by a catered luncheon meal provided by Kehillat Kernow. Kol Nidre, Erev Yom Kippur (Tuesday, 18 September), 9 Tishri 7:00 p.m.
Yischor Service is scheduled for about 4:30 – 5:00 p.m.. A catered dinner to break the fast will follow the last service which should end about 6:30 p.m. Visitors who will be here during this period are welcome to attend our celebrations and services. Donations to help cover costs will be appreciated. At the same time, we participate in the MRJ High Holy Days Ticket Scheme for anyone aged between 18 and 27, but without the tickets! In other words, if you are Jewish and aged between 18 and 27 just come along without worrying about making a donation. A highlight for this year is that we will be blessed with the services of Student Rabbi Lev Taylor, who is coming down from the wilds of London to work with Harvey and Adam on Kol Nidre and Yom Kippur, so another reason to add to those you already have to come along and join in our most sacred days. Lev grew up in Reading Liberal Jewish Community and has been part of synagogues in Barcelona, London and Istanbul. 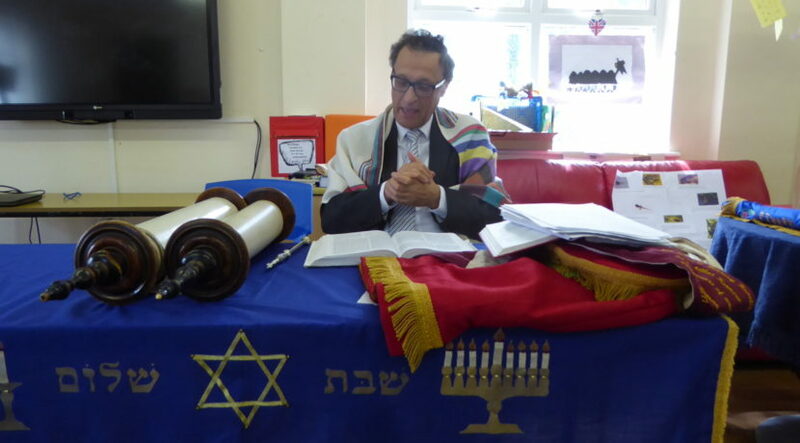 He worked for seven years as a campaigner in the charity sector before training to be a rabbi. He is now going into his second year of study at Leo Baeck College. Lev strongly believes in making Judaism more inclusive and accessible. The day will include opportunities for everybody to participate. In place of the Additional (Musaf) service on Yom Kippur, Lev will lead a study session, looking at the life of one of the greatest rabbis in the Mishnah. 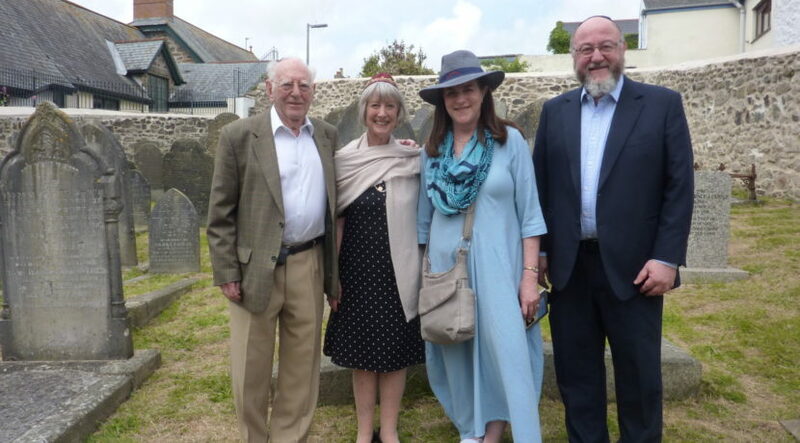 Chief Rabbi Ephraim Mirvis and his wife, Valerie, paid a visit to the Penzance Jewish Cemetery early in the day on Friday, 15 June whilst they were on holiday in Cornwall for a few days. They were welcomed by Ms. Louise Connell, Director of the Penlee Gallery and Museum, and Leslie and Pat Lipert from Kehillat Kernow. They were shown around the cemetery and learned some interesting facts about the historic cemetery and some of the people who are buried there. As a gesture of hospitality and sincere welcome, Leslie Lipert, treasurer of Kehillat Kernow and The Friends of Penzance Cemetery, presented the Chief Rabbi with the community’s signature Mezzuzah with its Cornish and religious symbolism. The visit, done in a private capacity, was part of the many interesting sites the couple visited whilst on their holiday in Cornwall. Members of Kehillat Kernow welcomed members of their extended family, Hannah and David Jacobs to Friday night services and dinner at Estelle Moses’ house on Friday the 28th when the couple travelled from their home in London to be with our community for the weekend. Associated with KK since its inception, David and Hannah have guided our community loyally through the years. Friday night was a sumptuous affair due to Estelle’s special flair for creating ambiance and marvellous food. David conducted the special Friday night service prior to the meal. On Saturday, Shabbat Emor, David and Pat Lipert conducted the Shabbat service. Following a bountiful Kiddush, Hannah then led us in a discussion of the history of anti-Semitism since Biblical days up to the current state of affairs in Britain. Chairman Jeremy Jacobson welcomed and thanked this much loved couple for working so hard to provide a very meaningful Shabbat for all our members. Many thanks to Estelle (and Charlie), who made a huge effort to provide the community with such a special Friday night. To see photos of Friday Night click here. To see photos of the Saturday Service click here. 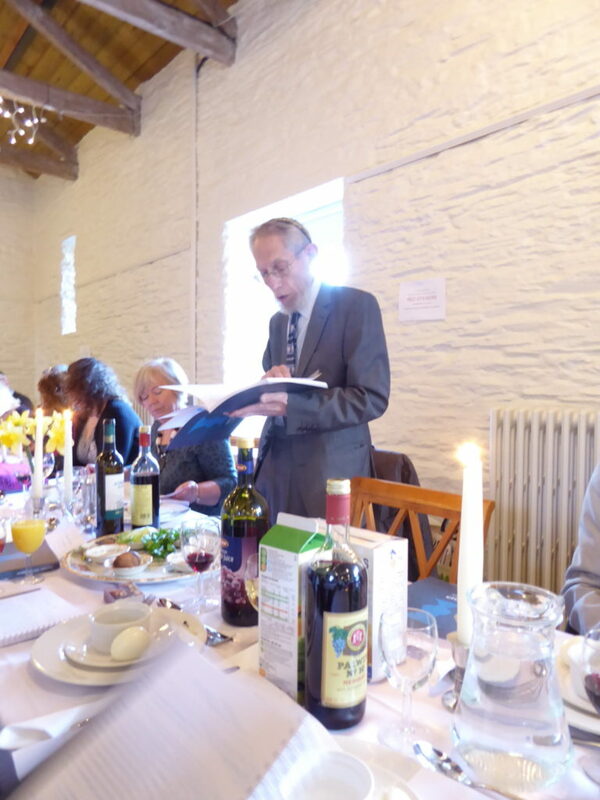 The first night of Passover and Shabbat were celebrated with gusto on Friday, the 30th of March, at The Barn in Trelissick Gardens in Feock by members of Kehillat Kernow and many visitors from around the world and greater England. It was more than sufficient and an exuberant first night of Seder from start to finish. Beginning with the lighting of the Shabbat and Yom Tov candles, the welcoming words from Chairman Jeremy Jacobson, the leading of the Haggadah reading with Life President Harvey Kurzfield, the four questions delivered by our children, to the after dinner service led by Adam Feldman, KK Vice Chairman, it is no wonder that our Pesach celebration is so popular. It was a night to remember our past, a time to rejoice in all we have, and a hope for a safe, auspicious new year. Many thanks to Anne Hearle who organises our first night of Pesach along with her family, David, Noah, Leah and Elisha to perfection, to all the chefs who catered to everyone’s needs, to our service leaders, Harvey and Adam and to Jeremy and Leslie Lipert who see to so many of the necessary details. Hag Sameach! Next Year in Jerusalem and Cornwall!